When considering purchasing a silencer, particularly since there are long wait times involved with tax stamp approvals, the decision should merit some thought. As a consumer, you’ll want to think about how man of your current weapon collection the silencer will suit. How well does it suppress? How durable is it? How difficult will it be to modify your weapon to host the suppressor? Will the suppressor handle multiple calibers? Will the suppressor be able to handle the rate of fire you will be practicing with? Will the suppressor be easy to clean? How heavy is it? How much does it cost? What about warranty? All of these factors were taken into consideration when we chose to purchase the SilencerCo Octane45 HD pistol suppressor. From the outset, we were looking to suppress several 1911 pistols, the FNX-45 Tactical, the Smith & Wesson M&P 9L, the Sig Sauer P938 and P238, the 300 AAC Blackout, and eventually an AR carbine in 9mm. The Octane45 HD is rated to handle them all, is rated for full auto fire and subsonic 300 blackout. Check those boxes off. SilencerCo has an industry-leading warranty service. The warranty is for life on each of their products, and they promise a 2-day turnaround time from the moment it arrives in their shop. When considering purchasing the suppressor, what pistons to purchase and mounting adapters, there were several occasions where phone calls were made to customer service. No matter who answered the phone, the reps were knowledgeable, courteous, and took the time to make sure questions were answered to full satisfaction. More on the warranty later. The process for purchasing a suppressor is fairly straightforward when using an NFA Trust. Simply bring a copy of it to your dealer, select the suppressor you want, make your payment, and submit 2 copies of your Form 4 filled out by you and your dealer, along with a check for $200 for the tax stamp. Your dealer sends the package to the ATF NFA branch where it is reviewed, and the approved stamp is sent to your dealer. A member of your trust then does a 4473 background check and takes possession of the silencer on behalf of the trust. Done. No matter what time of the year it is, finally having your suppressor in your hands is like Christmas! The box is packed with your suppressor, and you choose the adapter you want from your dealer that fits the thread pattern for your firearm’s barrel. We purchased the .578×28 for the FNX-45 Tactical and 1911, and the 5/8×24 for the 300 blackout. The adapters are in sold separately in re-sealable packages for storing. SilencerCo is offering free swag with registration of your suppressor, so in anticipation of the pending stamp approval, we submitted the form through their website and received a carry pouch with MOLLE connection – perfect for attaching to your range bag while going to and from the range if you don’t want to keep the suppressor attached to your weapon. Additionally there is a card in the box that you can send in for some free custom dog tags with the make, model, and serial number of your suppressor. Since we had a hunt within the next couple days, the first thing we were anxious to find out was whether the Octane45 worked well on subsonic 300 blackout ammunition. 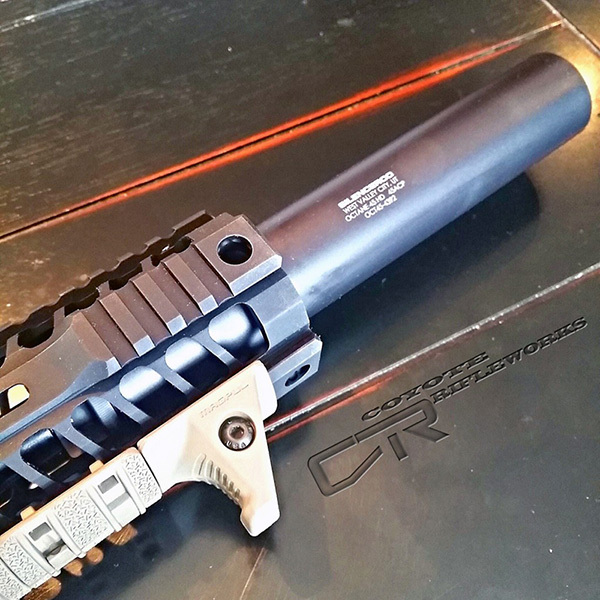 The 5/8×24 adapter was attached to the rear of the can, and then threaded directly to a 10.5” Daniel Defense barrel under a 15” handguard – the finished look of the firearm was perfect with the suppressor tucked under the rail. With a full mag slapped in and the first round chambered, the target was lined up and with effortless ease 220 grains of freedom was sent down range with the sound of only the action sliding back and forth against the JP Industries Silent Capture Spring. Another 3.5 pounds of pressure against the trigger and another thwack heard downrange when the round impacted the target. Through peripheral vision the man in the next lane could be seen removing his hearing protection to glean a closer inspection of what was going on in our lane. With a Cheshire cat grin, we obliged! “Holy crap, that thing is quieter than my 10/22!” “You wanna give it a try?” “Man, that’s an invitation I’ll never turn down! I just moved here from New Jersey and this is the most fun I’ve ever had!” Score another for Texas getting someone out from behind oppressing lines. Remember when I mentioned more about the warranty earlier? After our neighbor zealously let loose 5 or 6 shots in a row after our first 6-8 shots, the can had begun to heat up. We finished off the mag and decided to use the oven mitt sent from Silencer Shop to remove the suppressor. The adapter stayed attached to the barrel, and the thread lock that attaches the blast chamber to the tube had sufficiently heated up to become gooey and the can twisted loose, revealing the baffle stack. OOPS! Course was reversed and quickly twisted back together and left to sufficiently cool. Beads of sweat began to collect after waiting months for the can to arrive and dread of it going back to the manufacturer on a first outing. We removed the rail from the upper receiver in order to get better access to the base of the adapter and remove it from the barrel. We noticed that there was now a gap between the blast chamber and the tube, and the baffle stacks could audibly be heard shaking back and forth inside. Baffle strikes are no laughing matter, so the can was retired for the day. A call was placed the following morning to SilencerCo and the situation described. Without hesitation, a FedEx label was created and emailed within minutes to us. The rep reassured us that this is a problem that would easily be fixed, and the suppressor was in no way ruined. We asked if it would be possible to reheat the suppressor with a heat gun in order to liquefy the thread locker and tighten it in-house, and the rep said as long as you’re not using a torch and applying even heat, you’re fine. 5 minutes later and the Octane45 HD was restored to perfect operating condition and was ready for the hunting trip. It was very comforting to know that SilencerCo stands behind their product and is ready to honor their warranty – no questions asked. With tested results of the Octane45 HD and a 220 grain Sierra Match King subsonic round metered at 132 decibels, it rivals dedicated rifle suppressors. With 230 grain 45 ACP fired dry metered at 130 decibels, this suppressor is superb! Reducing the sound from unsuppressed 300 blackout subsonic about 25 decibels and 45 ACP 31 decibels, this means that you can eliminate having to hunt with your earmuffs or electronic headsets and be more in tune with Mother Nature. The weight of the can on the end of the rifle was unnoticeable. The weight of the can on the end of the FNX-45 Tactical was felt, but balanced by the 15 rounds of .45 in the magazine. As the magazine was emptied, a conscious effort was made to tilt the front of the weapon upwards to stay on target, which over time could lead to fatigue. Good thing all the time in the “gym” paid off for forearm development! With an MSRP of $891, and a street price of about $685, it isn’t “cheap” but few things quality built and reliable are. Adding up the cost of the Octane45, the trust, and the $200 tax stamp, and it’s a significant sum. Now consider how many weapons this single suppressor is capable of operating on, and how many tax stamps you’ll save, and you suddenly find yourself in possession of one of the best bargains there are! You should unequivocally buy the Octane45 and use it at every outing allowed. Your ears, your fellow shooters, and your inner ‘Merica will thank you for it!